Tacony Manufacturing has been selected by the Missouri Association of Manufacturers as a recipient of Made in Missouri Leadership Awards in two categories: Community Partner and After Market Services. The Made in Missouri Leadership Awards recognize Missouri businesses that demonstrate long-term commitment to their communities. Tacony Manufacturing is a division of St. Louis-based Tacony Corporation, a privately held manufacturer and distributor of sewing machines, home floor care and commercial floor care products, and ceiling fans. The company has 330-plus employees in the St. Louis area and more than 640 associates in 13 offices worldwide. Approximately 120 of those employees work at Tacony Manufacturing in St. James, Mo., where Simplicity, Riccar and Maytag vacuum cleaner brands are manufactured. The Regional Economic Commission in Rolla nominated Tacony Manufacturing to the Missouri Association of Manufacturers (MAM), in part, for the company’s corporate leadership in founding Tech 44, a statewide program to build collaboration and growth opportunities for companies along the I-44 corridor. St. James Mayor Jim White and City Administrator Harold Selby also submitted award recommendations citing the company’s dedication to job creation by moving its vacuum manufacturing to St. James from its Taiwan facility in 1997. Since then, the city of St. James has secured infrastructure grants to make a number of improvements to infrastructure that attracted other businesses to the city. 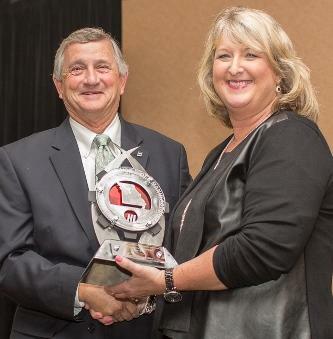 The Made in Missouri Leadership Awards were presented Oct. 2, 2015, at an awards celebration at the Doubletree Hilton in Chesterfield. Tacony Corporation Chief Executive Officer Ken Tacony accepted the award on behalf of the company. Award Criteria – The Community Partner Award recognizes manufacturers that demonstrate community involvement on the local, regional or state level. Honorees must show a long-term commitment to the community through civic improvement projects, support of community projects, impact on economic development, or a corporate culture that encourages these efforts. Tacony Manufacturing Contributions – In addition to bringing jobs to St. James, Mo., and founding Tech 44 to encourage further growth throughout the state, Tacony Manufacturing has contributed to a number of key empowerment programs and community development grants to enhance vital regional infrastructure. The company partnered with Missouri S&T University in Rolla to work with tomorrow’s engineers by giving them a place to apply skills learned at the university. The company has donated to every church within a 50-mile radius of the St. James as well as soldiers serving abroad; schools, universities, rural fire departments, 4-H groups and other charitable causes. The company also opened the quirky Vacuum Cleaner Museum at its manufacturing facility in 2009 to attract visitors from around the world to the area, further encouraging local commerce and tourism and show what American manufacturing can accomplish. Award Criteria – The Missouri Association of Manufacturers’ After Market Services Award is focused on recognizing companies that strive to achieve excellent products and service, engage customers, encourage product improvement, solve customer problems, and demonstrate commitment to a customer focus. Tacony Manufacturing Contributions – Tacony Manufacturing makes and distributes floor care products, including vacuum cleaners, floor scrubbers, carpet extractors and other products for home and commercial floor care. In qualifying for the After Market Services Award, the company demonstrated a longstanding commitment to service after the sale. Tacony provides consumers with a manned, toll-free number for assistance, as well as email and internet assistance. Live technicians work right in the factory where the products are built and have prior experience in manufacturing those specific Tacony products; this gives each technician a deep knowledge of each product and process in order to pinpoint a resolution to each unique service inquiry. The company uses this personal interaction with consumers to troubleshoot improvement to its products, as well as to continue innovation of new products in floor care. Tacony Manufacturing brands – Simplicity, Riccar and Maytag being the most recognizable – are sold by independent vacuum retailers, who receive regular and ongoing support from the company in the form of product and service training and other support. Tacony Corporation, a manufacturing and distribution company headquartered in Fenton, was also named to the St. Louis Post-Dispatch Top Workplaces of 2015 in June. The Post-Dispatch cited Tacony’s “family culture” in placing the company at No. 25 in the midsize employer category.